Today I want to share with you my method of grocery shopping that I’ve used for years. I find it to be a good way to reduce the hassle and stress of figuring out what to eat for dinner on a daily basis. As said in Hamlet, “There’s a method in his madness,” so if this doesn’t entirely make sense I apologize. However, I hope some of these tips can make your shopping experience a little easier. Shop for a week’s worth of food, but honestly you could do more. It’s a good idea to have a designated shopping day in mind, I prefer Saturday. 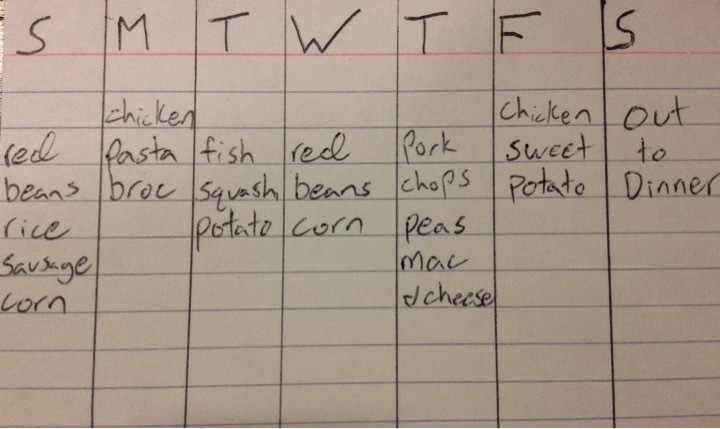 Start by writing out the days you’re purchasing food for. This includes a list of things I buy every time I go to the store. Such as what I eat for breakfast, what I use to make smoothies, and what I have for lunch. This step involves taking a quick scan of whatever you have available in the refrigerator or pantry. Start thinking of meals you can already cook or could cook with some extra ingredients. My dinner always consist of a meat or protein source, a carbohydrate, and a vegetable. Utilizing what you have, start filling in the blanks for each day and create your meals. Add what you don’t have to your list. Freezers are good at storing frozen meats, fruits, and veggies better than bulky cardboard boxes of processed food. If there’s a sale, stock up and freeze the extras, which can cut your future grocery list. Please share your thoughts or any other helpful tips! Ready to Hit the Store!